I have quite a few long trips coming up as we gradually move into summer. 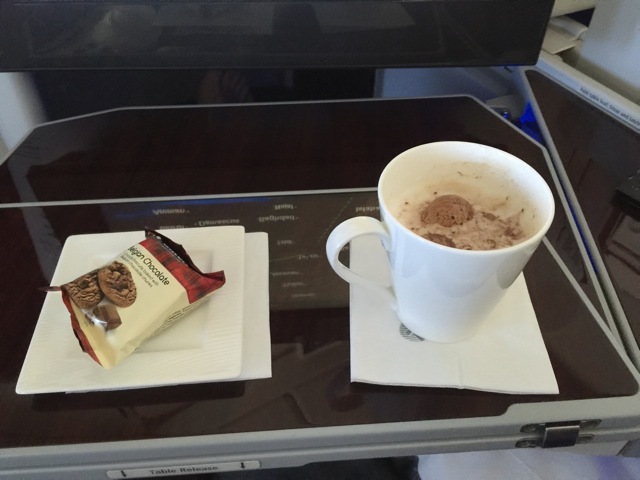 What’s more, these trips will see me doing a lot of firsts: new destinations, new aircraft types and new airlines. Today I am off to give a presentation in Singapore for ICAO. 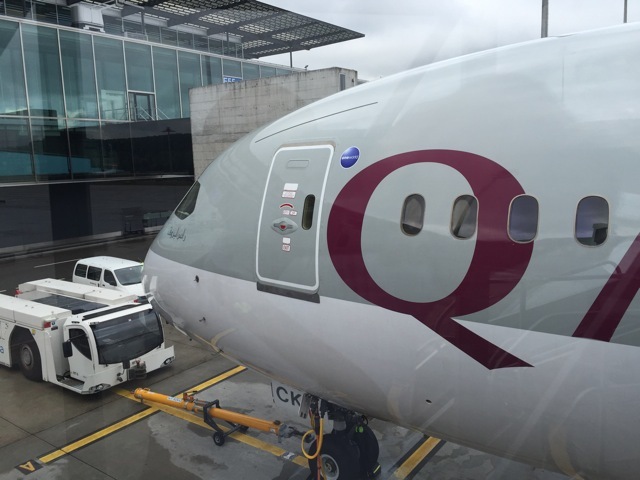 The first leg sees me travelling from Zürich to Doha on Qatar Airways. 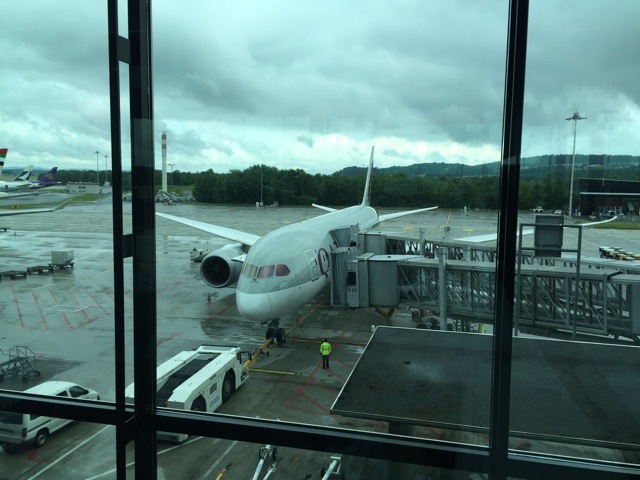 This will in fact be my first flight on the Boeing B 787-8. I am travelling with my colleague M. Not the valiant M., though. No, this is M. the tall, blond guy. Which is rather convenient because I think it will make him rather easy to spot if I should happen to get lost in a crowd in Singapore. Departs from: Basel SBB – Swiss Railway Station. Frequency: Roughly every thirty minutes. Journey time: About ninety minutes. Fare: CHF38 for a oneway ticket or CHF76 for a return. There is one direct train to the airport every hour at 40 minutes past the hour. The journey takes one hour and sixteen minutes to complete. 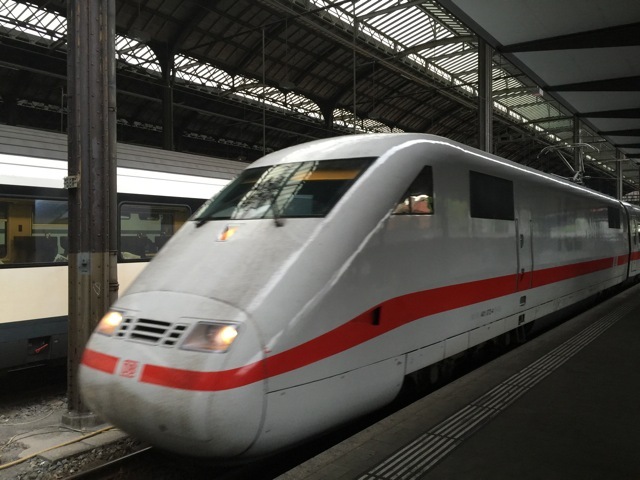 Alternatively, there are nonstop trains to Zürich Main Station at 7 and 33 minutes past the hour, which make the journey to Zürich in fifty minutes. At the main station you have to change to the airport train. 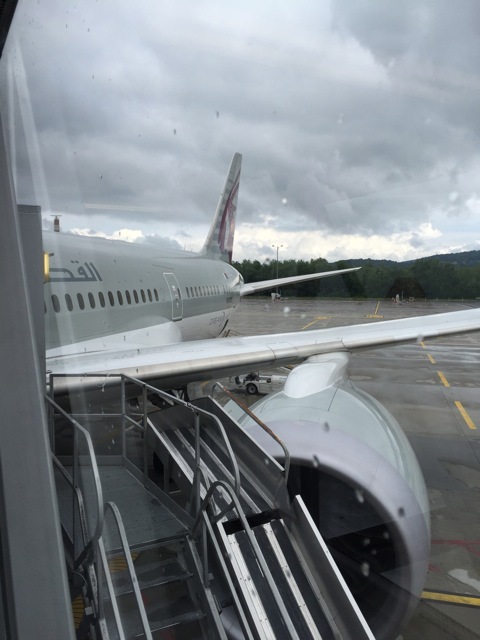 The journey from Zürich Main Station to Zürich Flughafen is another ten minutes, roughly. Tickets are valid on direct trains as well as trains via Zürich Main Station. My train leaves Basel at 08:07. Changing at Zürich main station that should get me to the airport at around 09:15. 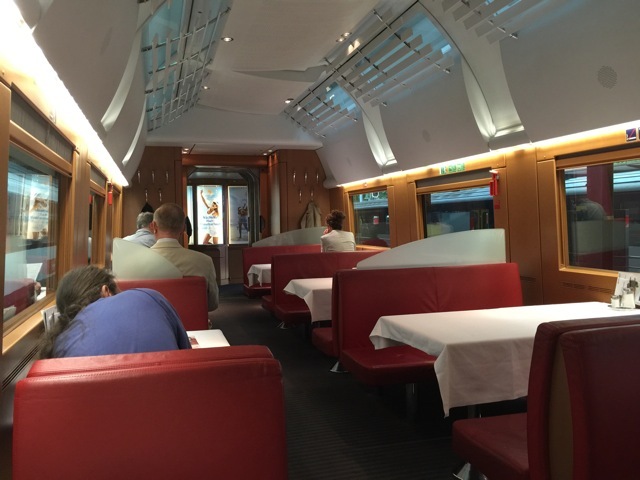 The 08:07 service to Zürich is operated by a German ICE high speed train of the Deutsche Bahn, so I figure I might as well avail myself of the dining car and get myself a decent breakfast. But I guess I really should have known better than to trust Deutsche Bahn to be reliable. 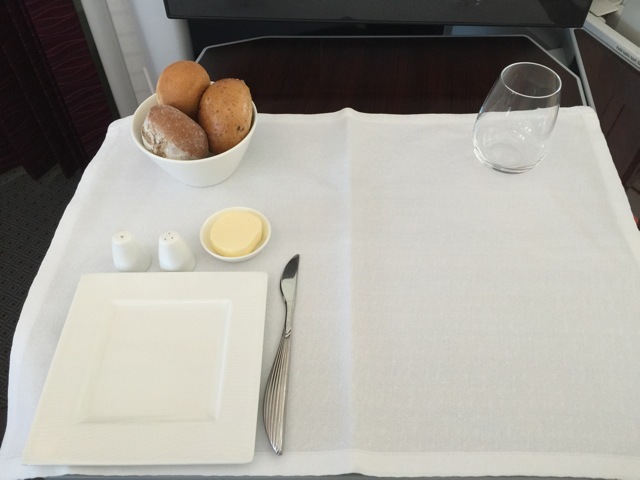 For some unearthly reason, they ‘forgot’ to load the food, dishes and cutlery today. So all there is on offer are stale croissants and coffee in cardboard cups. 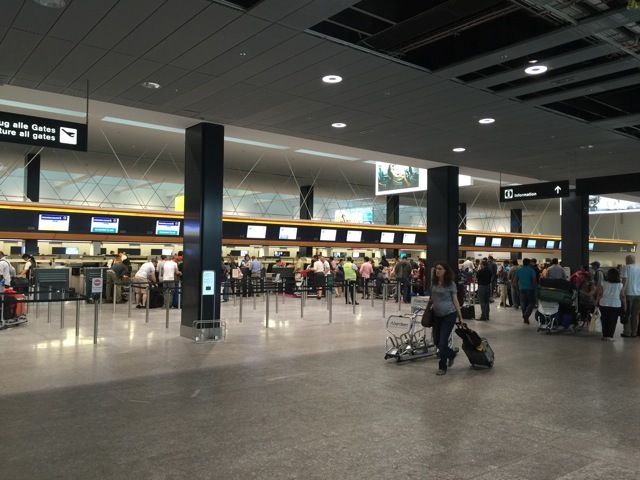 Facilities: Check-in is only available at the counters or via web check-in. 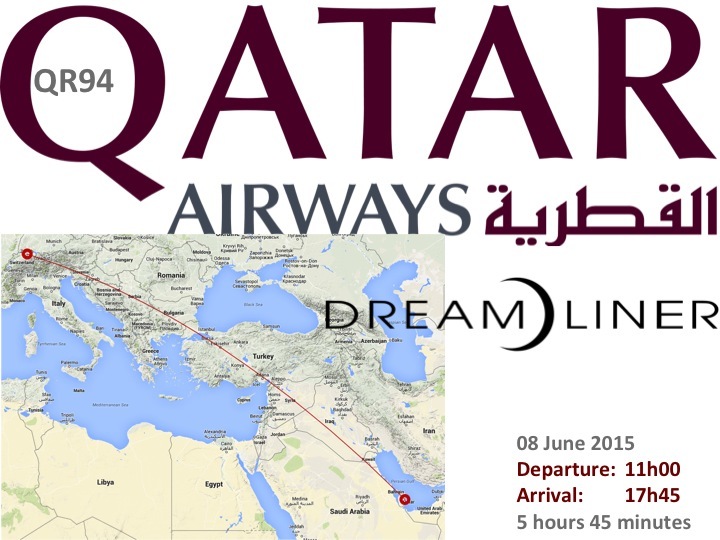 It is not possible to check-in for Qatar Airways the evening before. 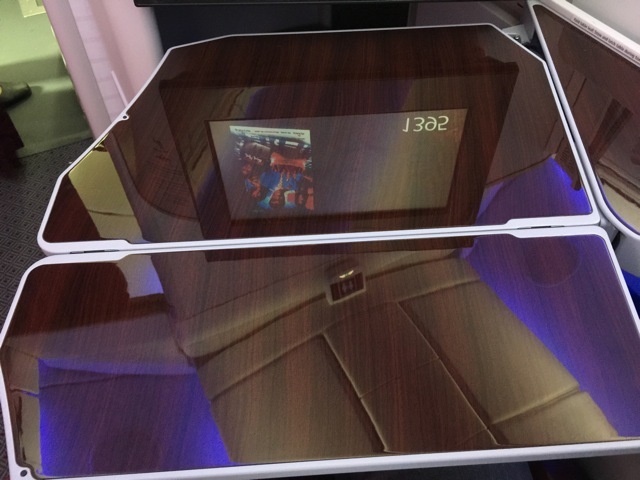 Counters: There are three Economy Class counters, one baggage drop counter, a Business Class counter plus a supervisor’s counter that doubles as a second Business Class check-in counter. 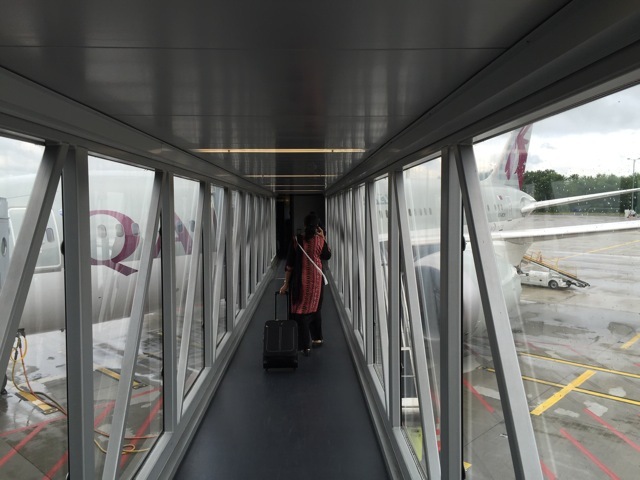 Location: There are two lounges available to Qatar Airways passengers in Zürich. 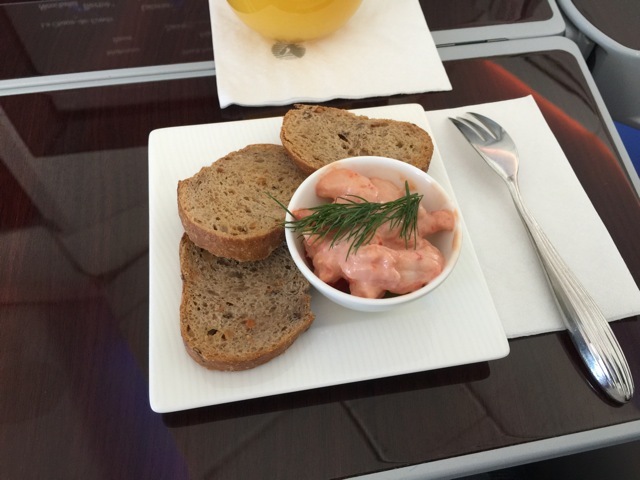 There is what I call the Oneworld lounge. This lounge is located adjacent to the SkyTeam lounge, one floor up from the public transit area. And then there is the Swissport Panorama lounge in the midfield dock E, behind immigration. I find this lounge is more conveniently located, seeing as that is where my flight will be departing from. Type of Lounge: This is a contractor lounge operated by Swissport. Facilities: A selection of newspapers and magazines, public computers and work stations. There are no showers and the toilets are located outside the lounge. 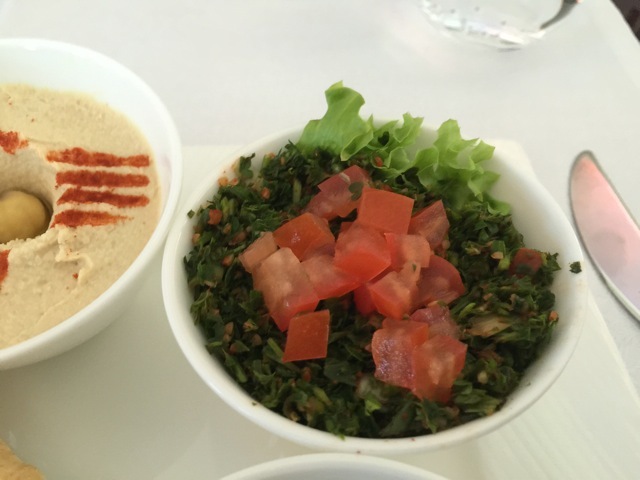 Catering: A limited selection of hot and cold dishes and beverages. 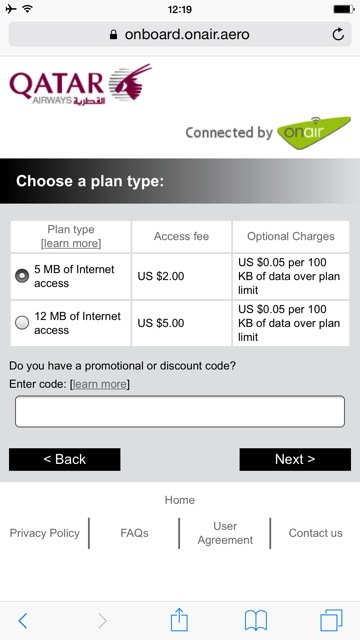 Internet: Free wifi is available. I cannot really say I like this lounge. It is simply too small for all the passengers that are allowed to use it, to the extent that they have added a further seating area right outside, in front of the entrance to the lounge, which is really not very cosy at all. The lounge’s only redeeming feature, as far as I can tell, is the view of the apron and runways on all sides. 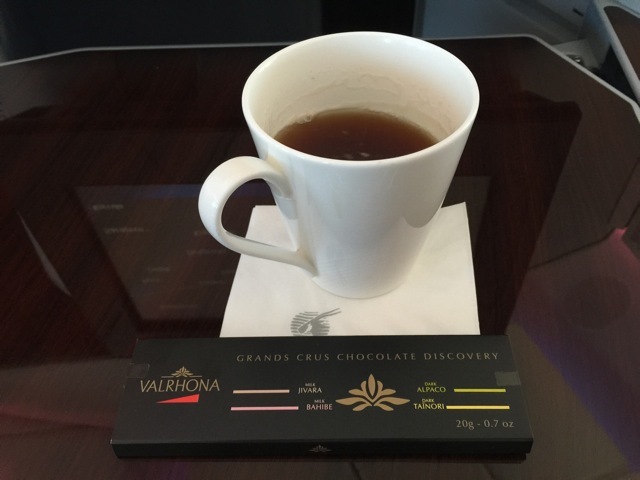 My stay in the lounge is only very brief, just enough time for a coffee and then it is already time to start boarding. 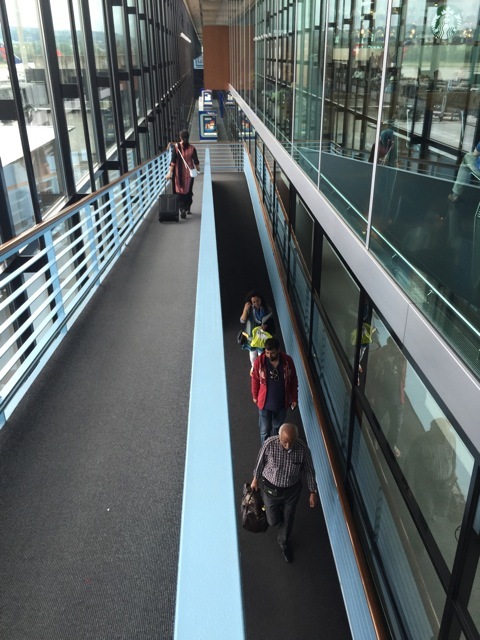 Priority Boarding: Available, however, there is only one airbridge for al passengers. 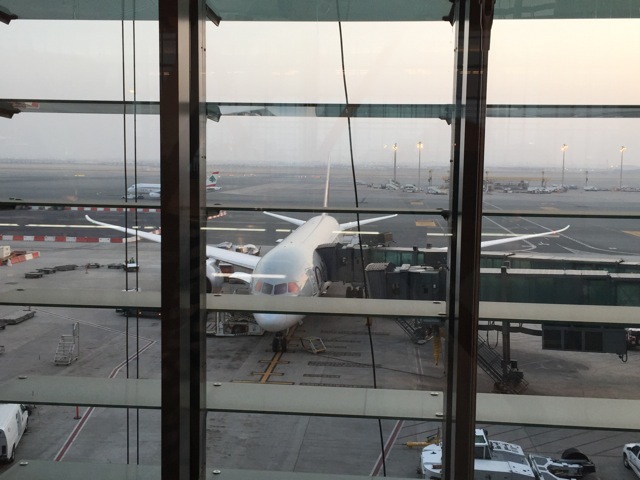 By the time I arrive at the gate, the flight is in the final stages of boarding. 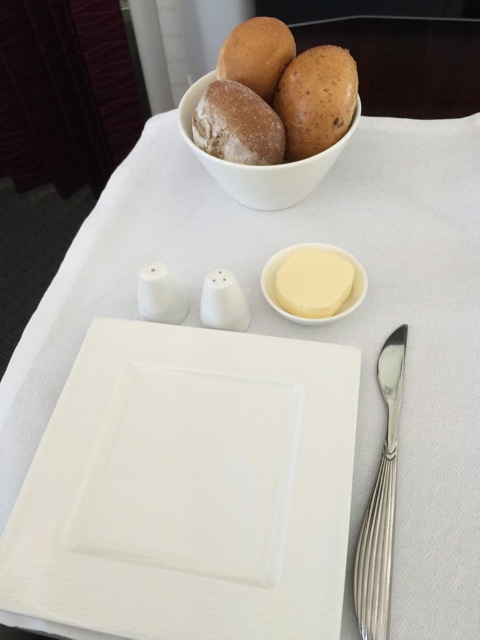 There is no queue for Business Class passengers. As I step aboard the aircraft I am greeted by a friendly young man and guided to my seat on 1E. Seat number: 1E, aisle in the middle row of two. Seat: There are twenty-two seats in total, all of which are 180 degrees lie flats. 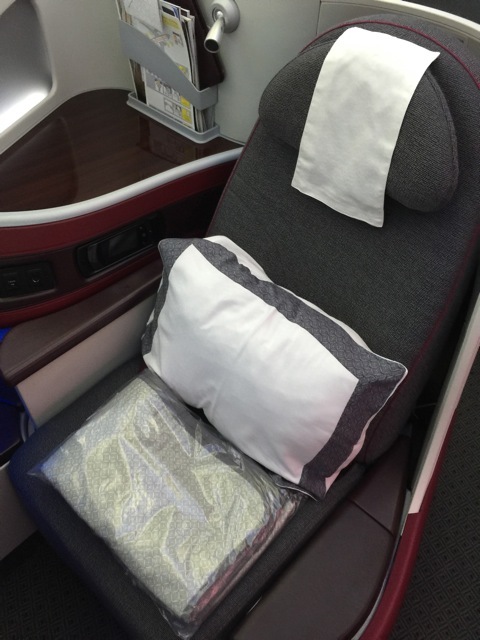 The seat is very similar to the one Cathay Pacific has installed in Business Class. The window seats are very private because they are angled to face in the direction of the window. 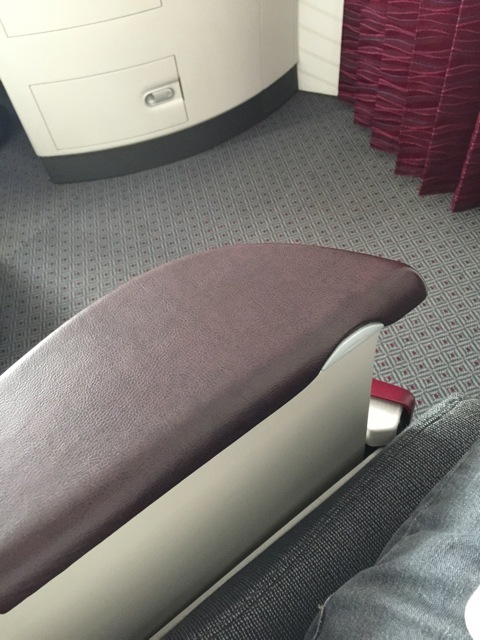 The two seats on the middle row point towards each other. Nonetheless, they still provide enough privacy because the seat is fairly deep, so the shell of it blocks your neighbour from view. And if the worst comes to the worst, there is also a screen that can be raised. 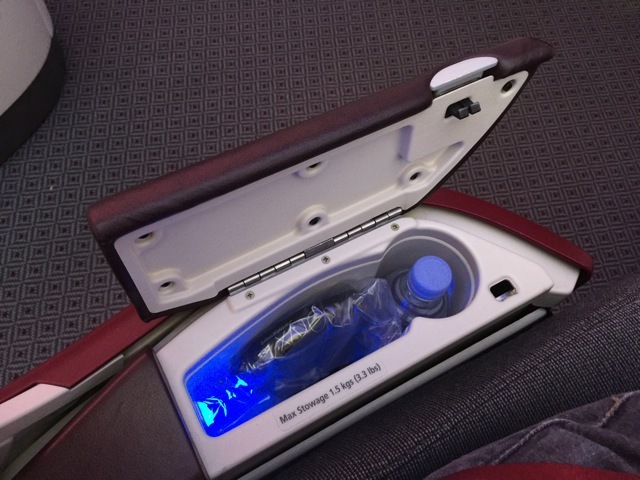 Facilities: AC power outlets are available at every individual seat in all cabin classes; wifi is also available on board at a charge in Business Class. 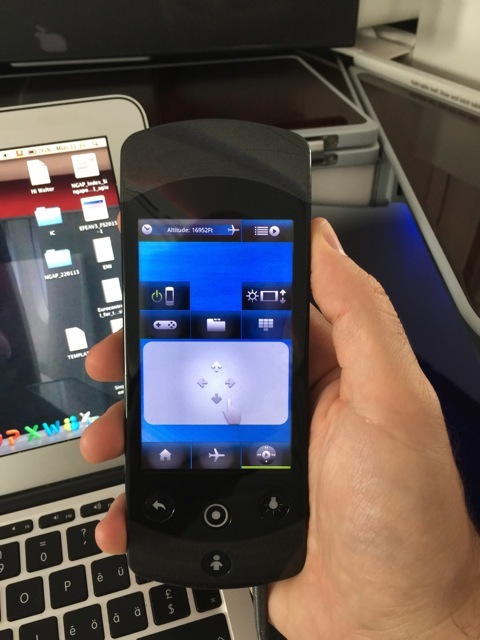 Audio and Video: Audio and Video on demand, with remote control or touch screen.Wifi is also available for a fee. The seat has a very elegant appearance. 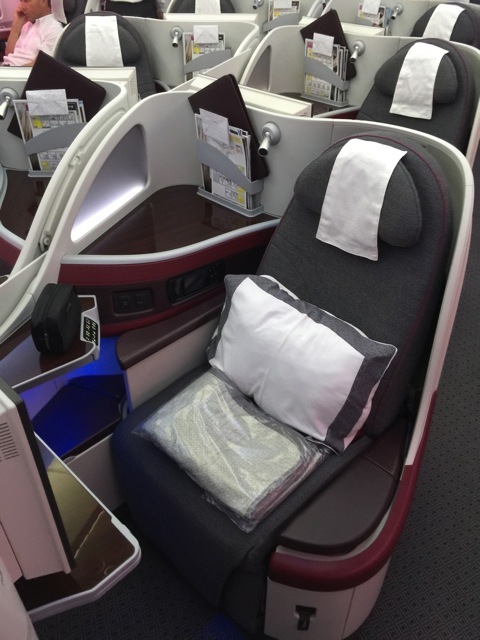 The combination of the dark grey upholstery with the Bordeaux coloured seatbelt and armrest is very easy on the eyes. 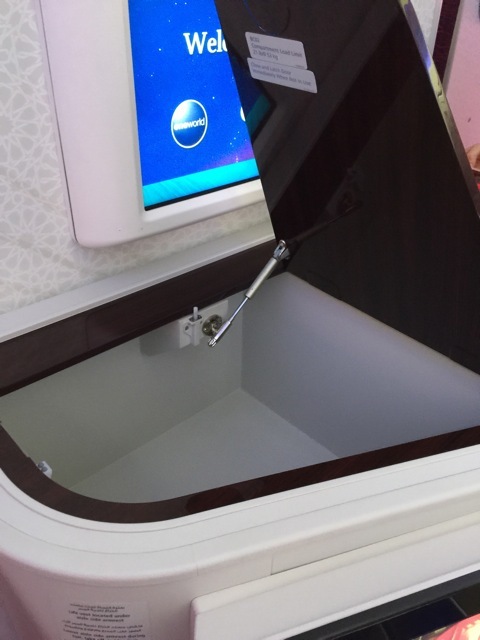 I think this is much classier than the Emirates cabin, for example. The seat provides ample storage space and it looks as though a lot of thought has been put into the layout of the seat. You do not have to twist and contort your body to reach the remote control for the IFE or to operate the seat controls. The cabin has a very open and airy feel to it, mainly I think this is due to a lack of a divider or anything of the sort near the L/R 2 doors and the fact that there are only overhead bins on the sides of the cabin but not in the middle. 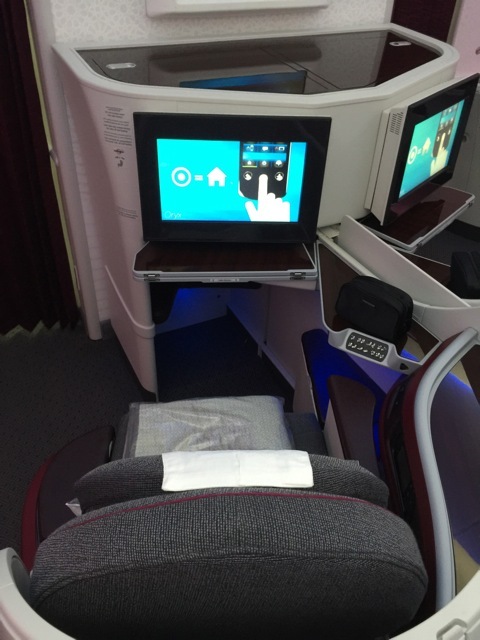 Just a word of caution: on the B 787-8, Qatar Airways the last row in Business Class is an individual row that is segregated from the rest of the cabin by the L/R 2 doors. There are only two seats on this row in the middle. It just looks kind of strange, and I think I would feel rather exposed if I had to sit there. Furthermore, you have a toilet on either side. The crew on today’s flight are friendly and personable. As soon as I take my seat I am welcomed by April from the Philippines, who promptly asks me if I would like a drink and if I prefer a hot or a cold towel. 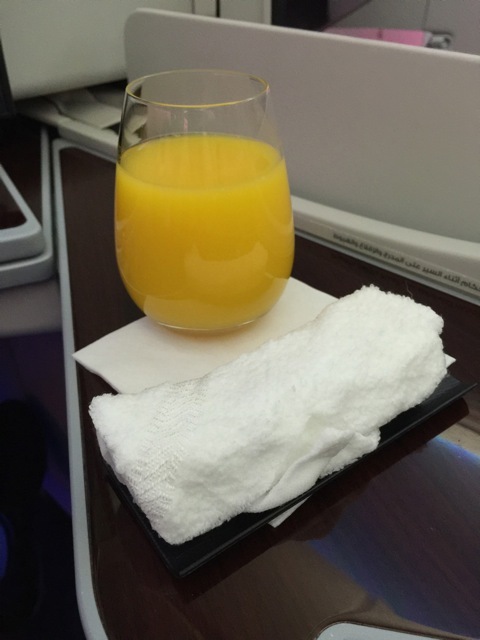 I ask for an orange juice and a cold, refreshing towel. The towels are not scented. 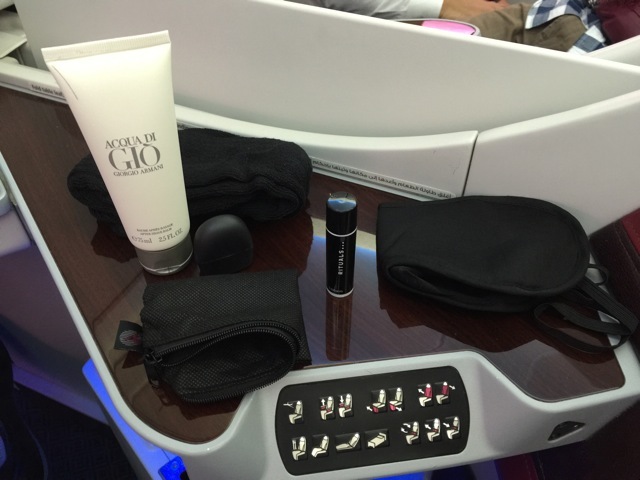 The vanity kit has already been placed at me seat, together with the menu, a blanket and a pillow. Slippers and pyjamas are not provided on this flight. The vanity kit does not contain a toothbrush or shaving kit. However, both are available in abundance in the lavatories. 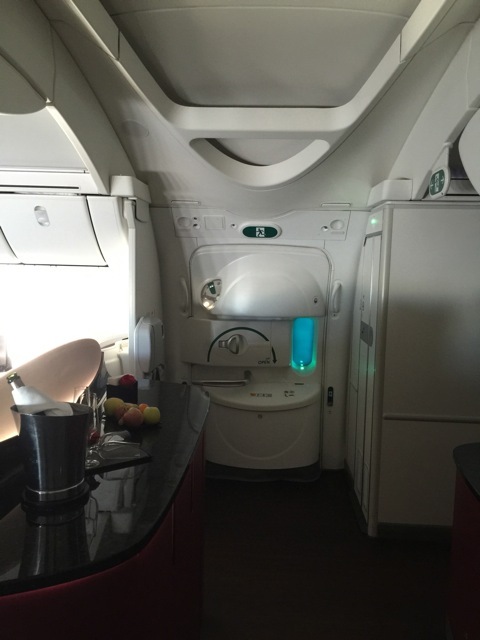 Speaking of which, the toilets were kept very clean throughout the flight and were checked regularly by the crew. 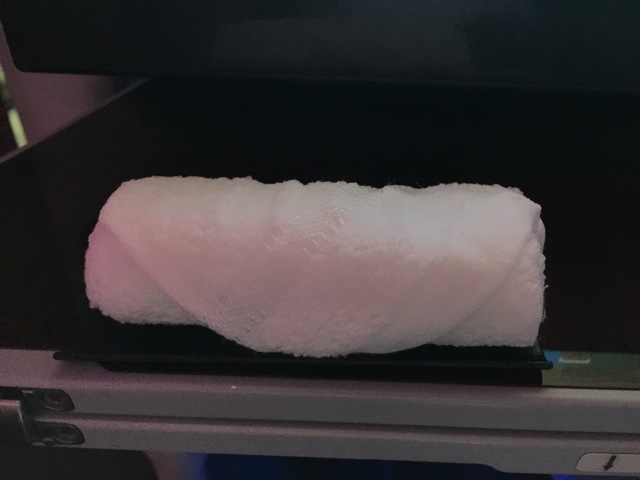 Hot towel before the meal: Cold towel while still on the ground. Pre-meal drink: Lemon juice with mint. 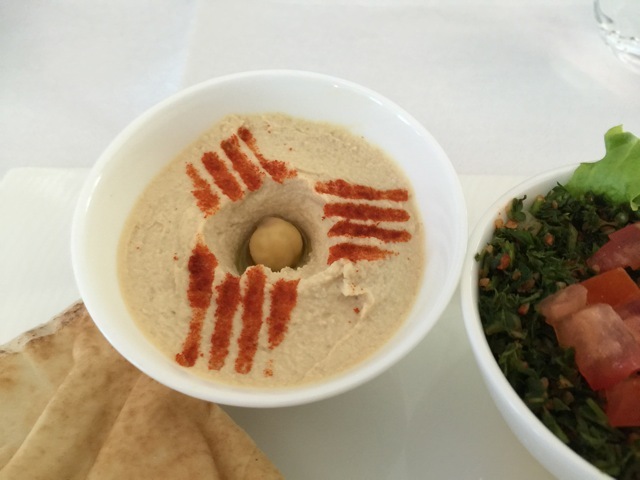 Choice: There are two choices for the starter, three choices for the main and another three choices for dessert. 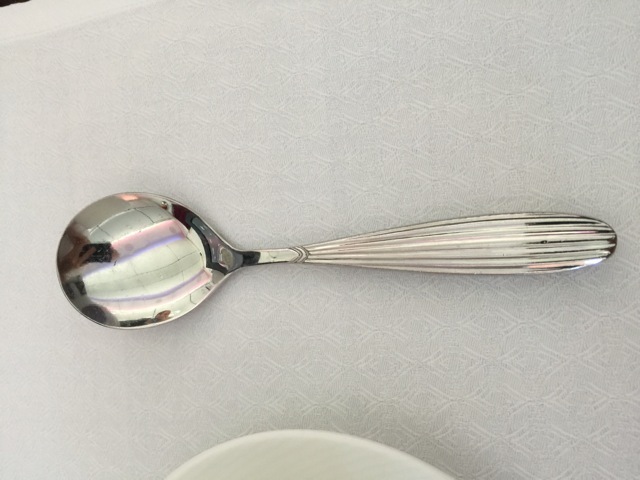 Appearance: The meal service is very elegant. 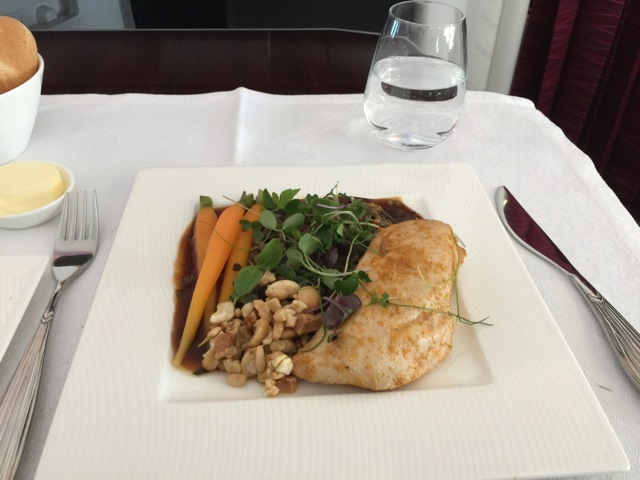 Unlike many airlines, who serve the food on a tray from a trolley, with Qatar Airways, every table is set up and served individually, directly from the galley. Amuse bouche: prawns in a Mary Rose sauce with crostini. 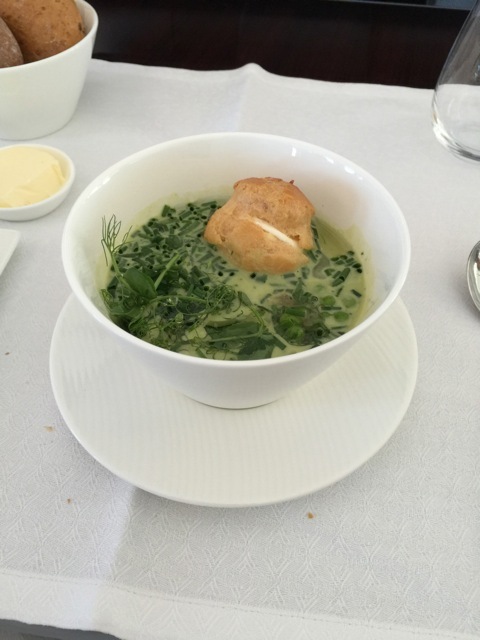 Soup: Pea and mint soup with lemon crème fraîche and a choux bun. 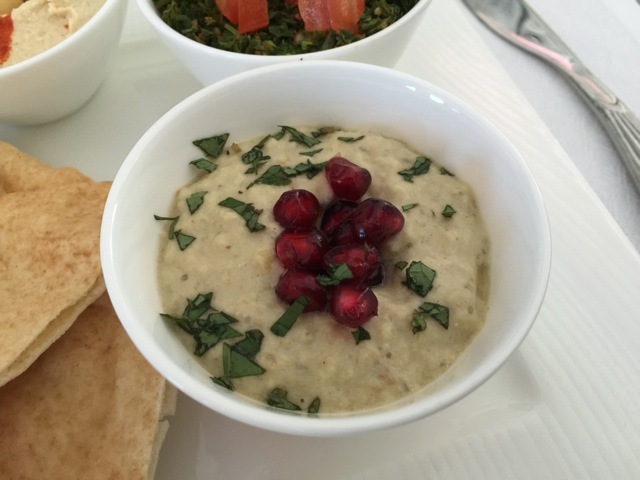 Starter: Hummus, tabouleh and moutabel with Arabic bread. 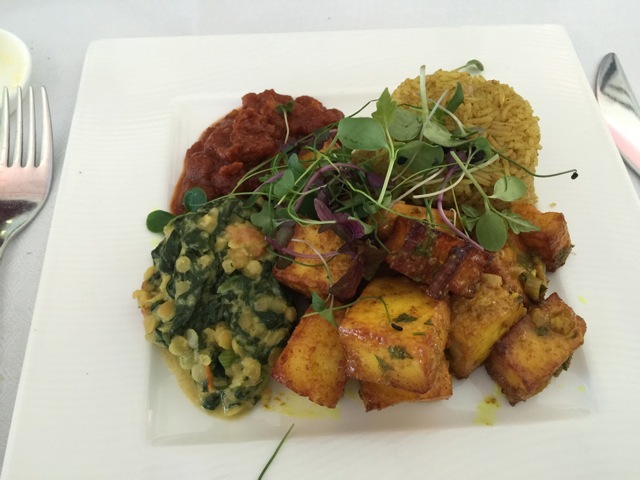 Main: Tandoori paneer with musallam sauce, vegetable khichdi and saunfiyan palak. 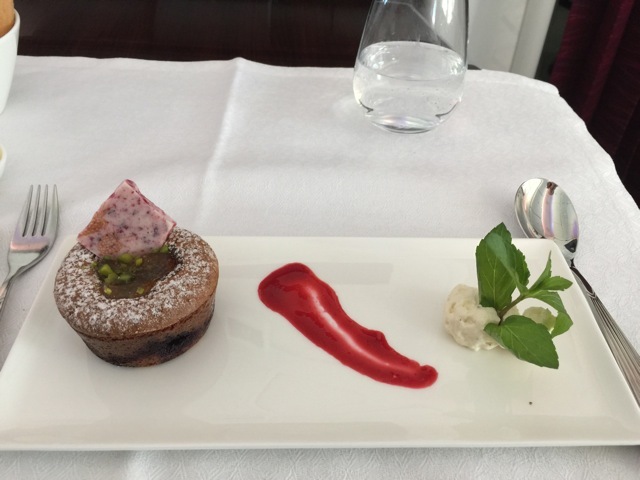 Dessert: Cherry and almond frangipani tart with vanilla mascarpone and raspberry coulis. There would also have been a cheese plate, but I decided to skip that in favour of dessert because I was already so full. 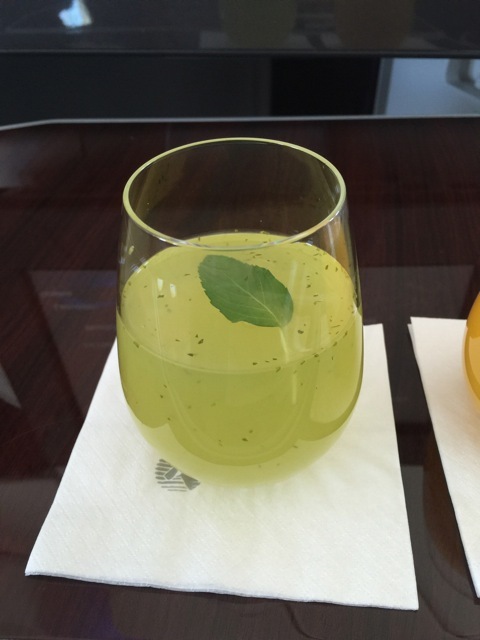 My colleague M. has given me strict instructions to make sure I comment on the fabulous lemon and mint juice Qatar Airways serve. And indeed, I must say it really does taste absolutely delicious. It is admittedly very sweet but it is also very refreshing. 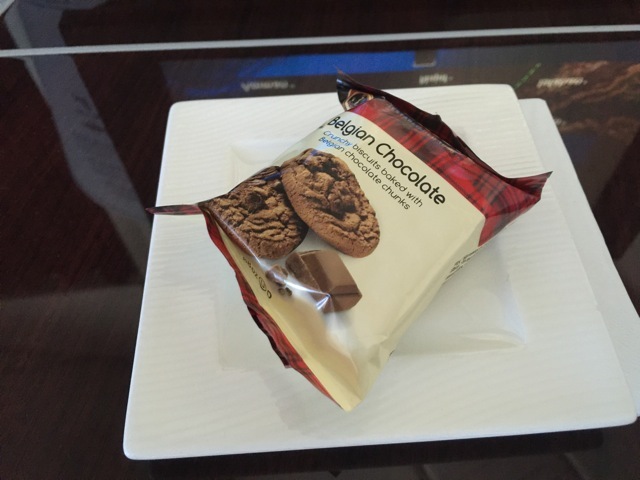 But apart from that, the quantity and quality of the food is really very good and very much has the look and feel of what many other airlines are serving in First Class these days. 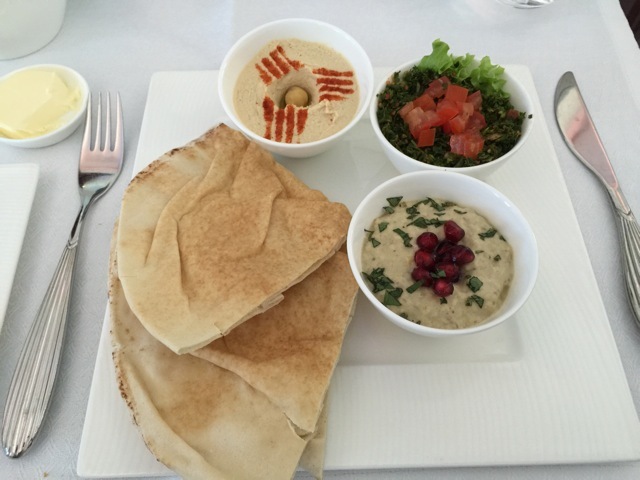 I particularly like the presentation of the food. 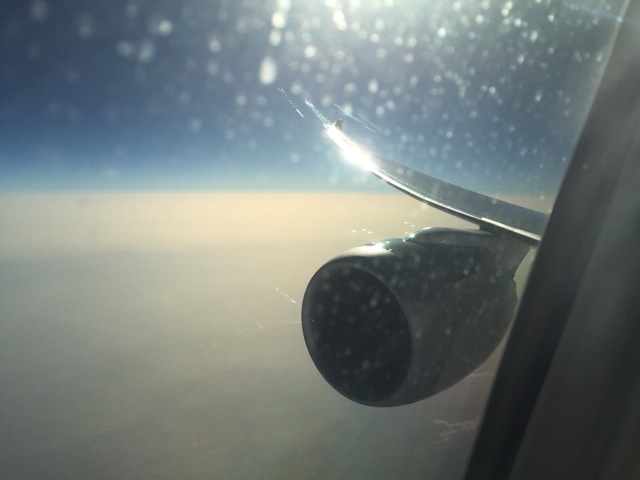 The sun is slowly starting to set as we begin our descent into Doha. 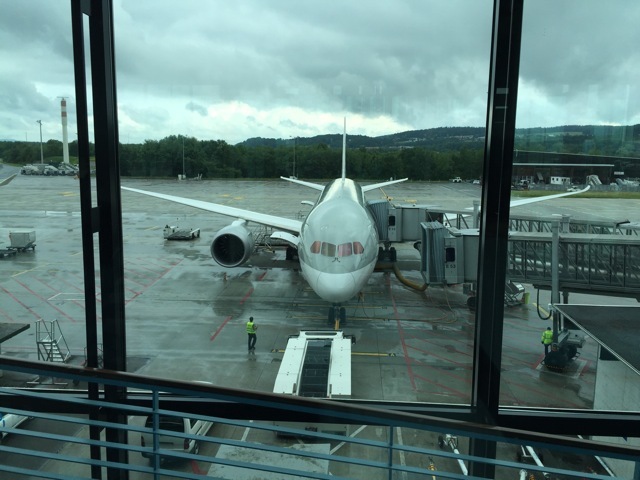 Eventually we land with a delay of roughly twenty minutes, which is partly due to our slightly late departure from Zürich and a further, slight delay we must have picked up en route. 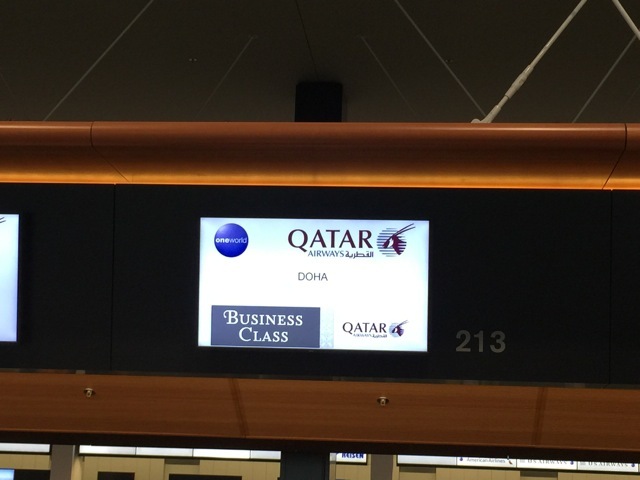 The airport is not particularly busy when we arrive, with just a few Qatar Airways aircraft scattered around the place. I now have about two hours to make my connection to Singapore. There is a centralised security area for transfer passengers. 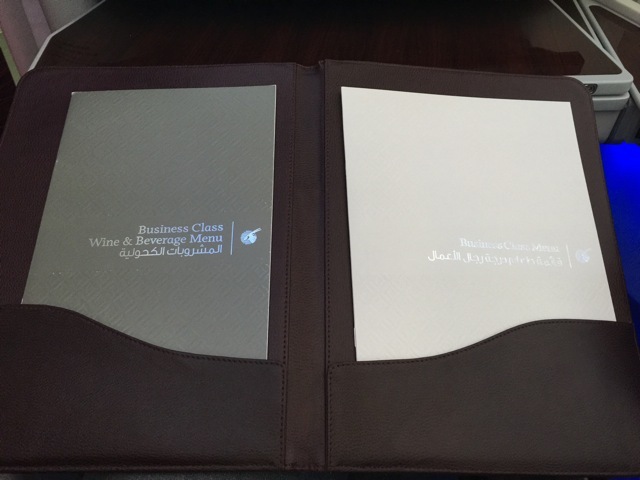 There is a separate queue for First and Business Class passengers. Even so, it looks as though a flight from India has just arrived at the same time and obviously most of the passengers do not seem to care about the separate queue, while the staff obviously can not really be arsed to segregate the queue properly. 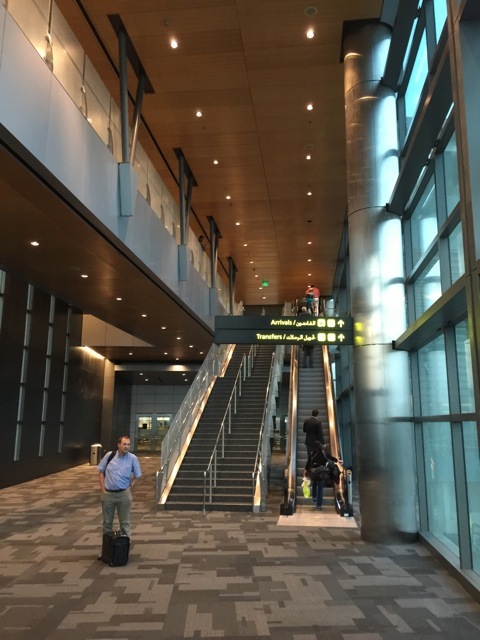 The new terminal is really quite impressive. The facility is very modern and still looks and feels very new. In fact only part of the building has already been opened for passengers. The two concourses that make up the Y of the building, if you are looking at it from above, are still closed off. There is even a metro that runs through the terminal, which is running but obviously not accepting passengers yet, judging by the plastic covers still on the seats. 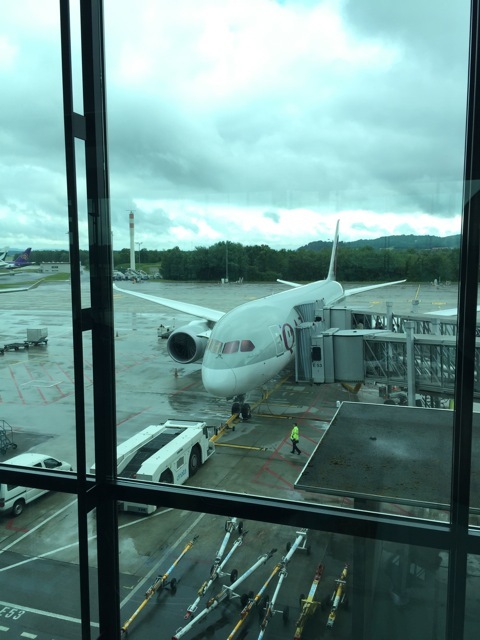 This is the first time I am travelling to Southeast Asia with one of the ME3. So far, I have always been under the impression that these carriers have a disadvantage over carriers operating a nonstop service from Europe. However, all things considered I find it rather pleasant to have the opportunity to interrupt the journey more or less halfway there, if only to stretch my legs and break the journey. 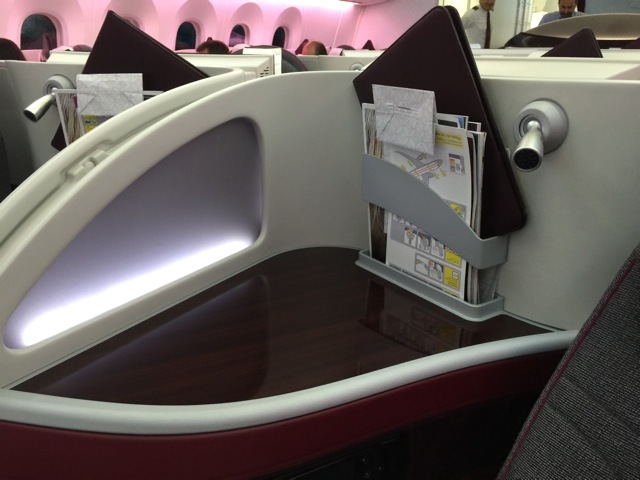 As for Qatar Airways, so far I must say I am quite impressed. 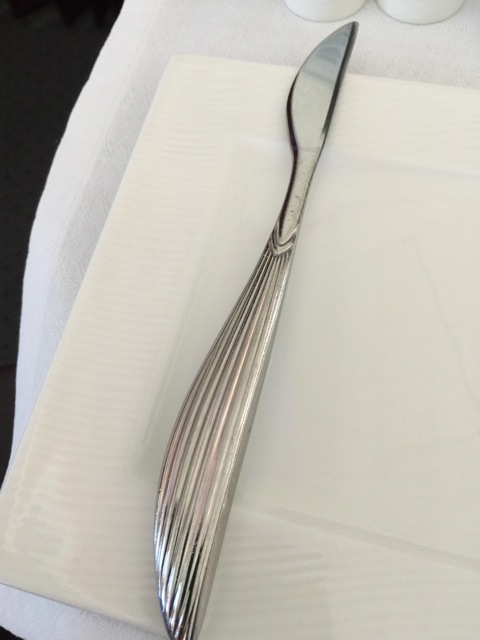 Their service and on board product is very polished. 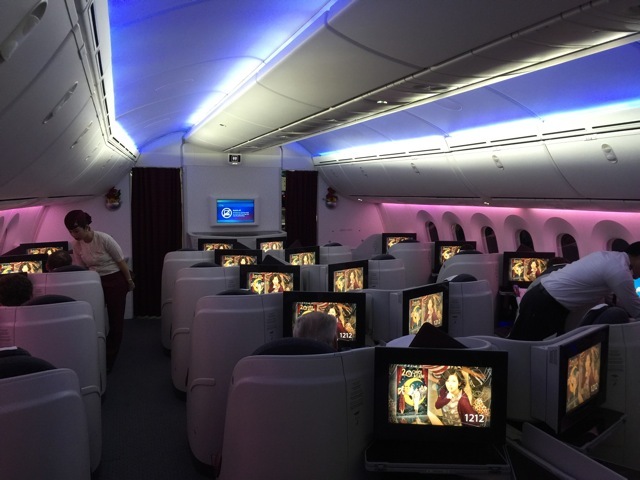 It also seems far more sophisticated and elegant than what Emirates has to offer. 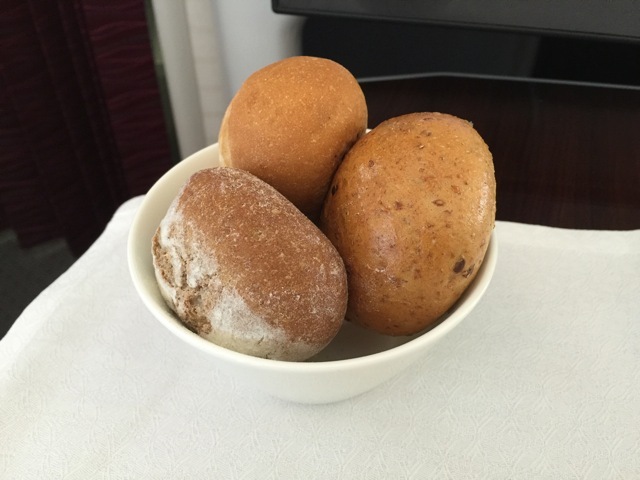 The Emirates product is also very good, but it is more functional than it is stylish. 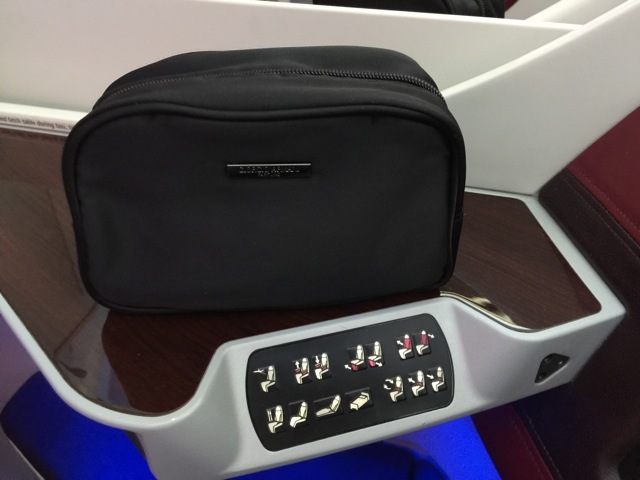 This entry was posted in Boeing B 787-8, Business Class, Qatar Airways and tagged airlines, aviation, Business Class, business class passengers, business class seat, departure gates, flying, passengers, Qatar Airways, transportation, travel, Zürich Flughafen, zurich airport. Bookmark the permalink.